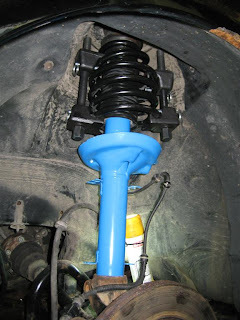 I upgraded, as mentioned below, some of the Jetta's front suspension the other day. 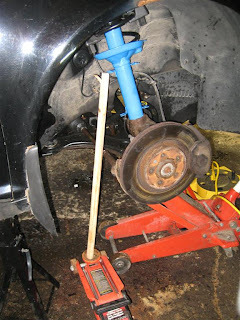 After realizing that my Princess Auto spring compressors were universal, and needed some customization to work properly in the Jetta wheel wells (cut off about 4" on each one), the struts went in nice and easy! 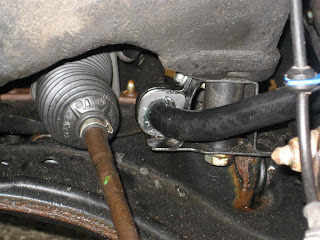 The front sway-bar bushings were super-easy to replace as well. 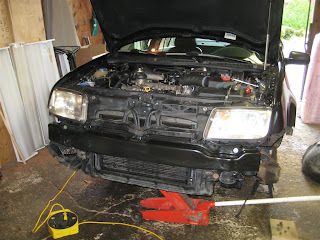 You can see in the one picture how I got the strut mounts off and then re-torqued. 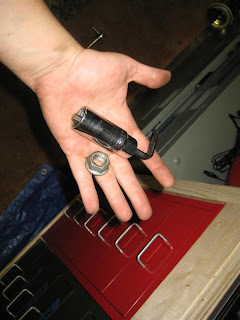 While I was waiting for H to come by with a bolt-out kit (that proved fruitless against the might of the dogbone mount corrosion), I decided to get rid of the rest of the skunk smell (see short story). 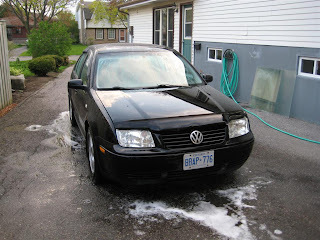 It was awful, and permeated the garage until I found it. No picture...cuz it's gross. 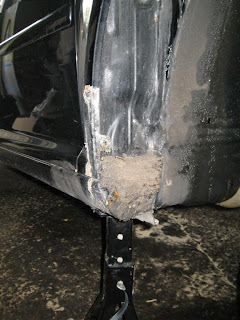 Found the passenger wheel well filled with dirt, behind the plastic guard! There's a write-up on the TDIclub forums about that...I'll link to it when I have a minute. 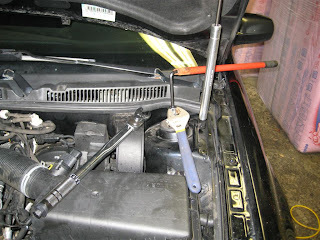 To get the passenger strut pushed in, we used a dowel and a small floor-jack - worked like a charm! To get at the skunk smell I had to remove the entire front bumper cover - it did give me a chance to replace a few bulbs while I was at it. A few more bits I didn't do because of time and patience - rear a-arm TT bushing replacement. 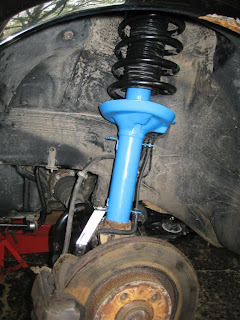 I have the parts...but I'm terrified of breaking loose that captive nut inside the subframe, and I don't have any easy access to welding equipment. 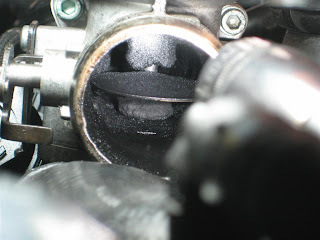 The intake is another looming job...gross!